You don't have to be a master of the grill to enjoy a great steak. With a cast iron skillet and a hot oven, you can make yourself a mouthwatering meal, featuring a perfect steak cooked just the way you like it. 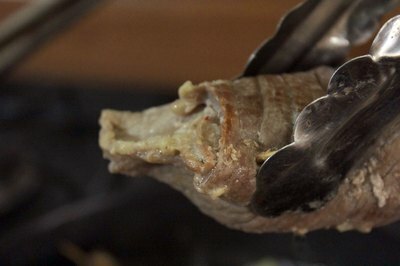 The technique is straightforward: marinated meat is seared prior to roasting to seal in the flavor, the golden brown steak is then transferred to the oven for finishing, generating a terrific result with a minimal investment of time and effort. When selecting steaks for oven cooking, you will need to pay close attention to thickness and weight in order to achieve satisfactory results. Select steaks which are between 12 and 16 ounces in weight and approximately 1 ½ inch thick as thinner, lighter cuts may dry out. Thirty minutes prior to cooking time, place the steaks in a shallow dish and season with salt, pepper and garlic. Rub a generous spoonful of olive oil on to each side of the meat, massaging gently. Cover the pan with a clean towel or a piece of plastic cling film and allow the steaks to rest on the counter. Place a well-seasoned cast iron skillet inside the oven and turn the temperature to 500 degrees Fahrenheit. Allow the oven to preheat for at least 20 minutes. Remove the skillet from the oven and place it on top of the stove over medium-high heat. Take the steaks out of the dish and place them in the hot, dry skillet. Do not adjust the steaks once they have made contact with the pan's surface as this will disturb the caramelization of the meat. Wait three minutes and then lift up the edge of the steak and inspect the underside. If the meat is well-browned, turn it over. 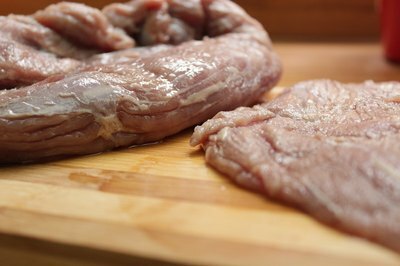 Browning is generally achieved in less than five minutes, but results will vary. Once the meat has been turned, remove the skillet from the stove top and place it in the oven. Turn the temperature down to 450 degrees Fahrenheit. After three minutes, remove the pan from the oven and check the steak by inserting a meat thermometer. The internal temperature of a rare steak is about 120 degrees Fahrenheit, medium rare is 130, medium is 140, medium well is 150, and well done is 160. If your steak has not achieved the preferred level of doneness, return it to the oven, checking the temperature every two to three minutes until it has achieved the desired results. Remove the steak from the pan and allow it to sit upon a warm plate for five minutes before serving, as this allows the heat to become more evenly distributed throughout the meat. Learn how to cook a medium rare steak for delicious results, including tips and serving suggestions.